Eastern sophomore Tessa Rockhold leads a fast break, during the Lady Eagles’ 47-37 victory on Thursday in Tuppers Plains, Ohio. Wahama sophomore Emma Gibbs (11) goes in for a layup in the second half of the Lady Falcons’ 10-point loss on Thursday in Tuppers Plains, Ohio. TUPPERS PLAINS, Ohio — The middle quarters made the difference. 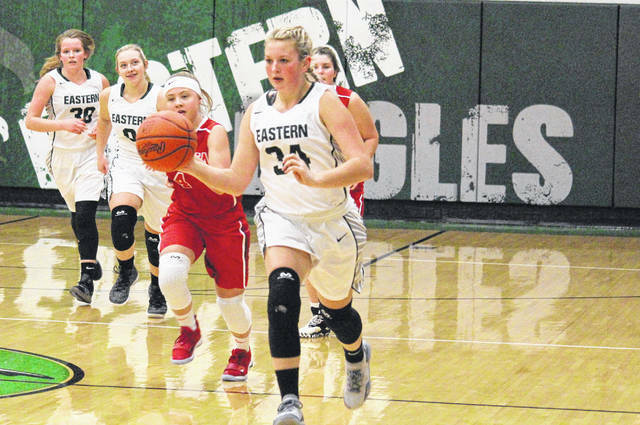 The Eastern girls basketball team defeated Tri-Valley Conference Hocking Division guest Wahama by a 47-37 count on Thursday in Meigs County, with the Lady Eagles outscoring WHS by a 29-11 clip in the second and third periods combined. The Lady Falcons (1-1, 1-1 TVC Hocking) — just 24 hours removed from a seven-point win over Trimble in their season opener — led initially and outscored Eastern (3-1, 3-0) by a 5-3 clip in the opening four minutes. The Lady Eagles — winners of back-to-back games for the first time this season — took the lead, at 6-5, on a Jess Parker three-pointer with 3:19 left in the first, and never trailed again. EHS stretched its lead to double digits within two minutes, but Wahama scored the final four points of the period to trim its deficit to 15-9. The Lady Falcons cut the margin to four points with an Emma Gibbs two-pointer a minute into the second period, but the guests were held off the board for the remainder of the half. Eastern poured in 15 straight points and headed into the break with a 30-11 advantage. The Red and White snapped out of their cold spell with a 7-4 run at the start of the second half, making the EHS lead 34-18 with five minutes to go in the third period. The hosts finished the quarter with a 10-2 run, however, putting their advantage at 44-20 headed into the finale. With Eastern’s starting-five on the bench, Wahama outscored the hosts by a 17-3 count over the final eight minutes, leaving Eastern with a 47-37 victory. The Lady Eagles were 20-of-64 (31.3 percent) from the field, including 3-of-17 (17.6 percent) from three-point range in the contest, while the Lady Falcons shot 14-of-41 (34.1 percent) from the field, including 1-of-3 (33.3 percent) from beyond the arc. Both teams struggled at the free throw line, Eastern shooting 4-of-11 (36.4 percent) and Wahama making 6-of-21 (28.6 percent). The Green and White won the rebounding battle by a narrow 38-37 clip, including 16-to-13 on the offensive end. Collectively, the Lady Eagles had 13 assists, 14 steals, three blocked shots and 16 turnovers. Meanwhile, WHS finished with team totals of five assists, nine steals, seven rejections and 21 turnovers. 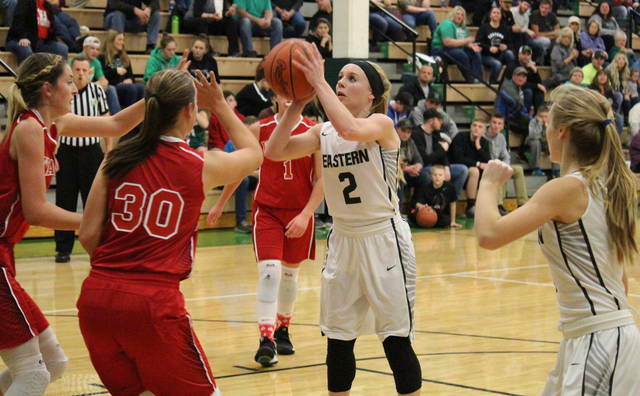 Jess Parker led the EHS offense with 18 points, half of which came from beyond the arc. Alyson Bailey finished with 10 points and a game-best four assists for the victors, while Olivia Barber ended with eight points and a team-high 12 rebounds. Kelsey Casto and Tessa Rockhold tallied four points apiece for the winning side, Sydney Sanders chipped in with a pair of markers, while Brielle Newland contributed one point. 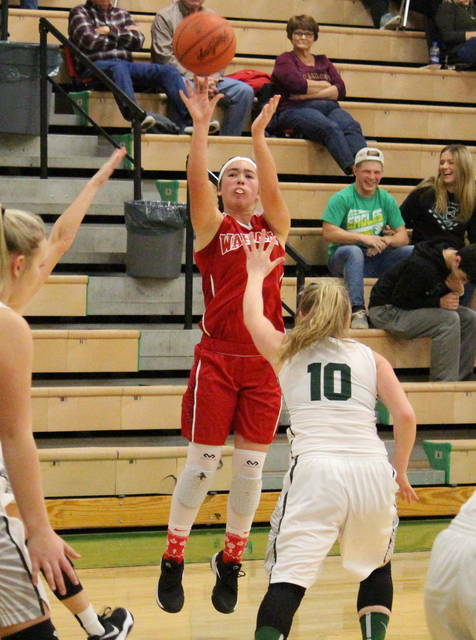 Barber led the EHS defense with five steals and three blocked shots, followed by Parker and Kelsey Casto with three steals apiece. Gibbs led the Red and White with a second straight double-double effort, this time scoring 16 points and pulling in 15 rebounds. 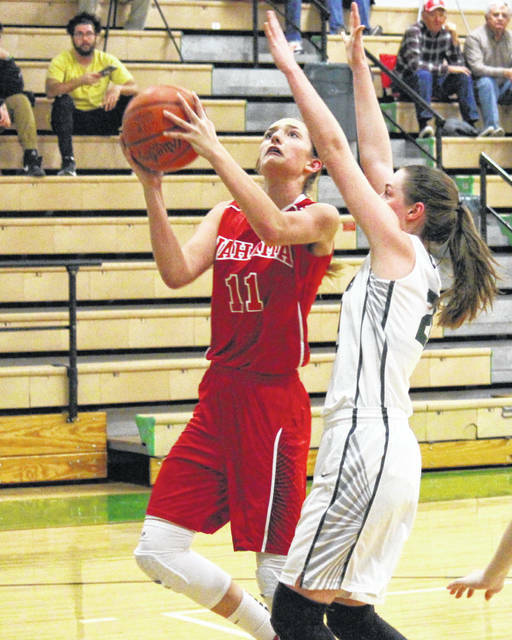 Hannah Rose was responsible for the team’s lone three-pointer and finished with 13 points, while WHS freshman Lauren Noble marked five points in the setback. Harley Roush contributed two points to the Lady Falcon cause, Bailee Bumgarner added one point, while Victoria VanMatre finished with a team-best two assists. Wahama’s defensive effort was led by Rose with five steals and a block, and Gibbs with five blocks and a steal. The Lady Eagles and Lady Falcons are set for a rematch on Jan. 17 at Gary Clark Court in Mason. Wahama continues TVC Hocking play at Southern on Monday. The Lady Eagles will also be back on the court Monday, as they host Warren for a non-conference clash.